DESCRIPTION: This double fronted Victorian house sits proudly on a good sized site in a residential area of Pudsey. Although the front of the property has a real distinguished appearance, the three remaining sides of the house lack a certain quality. Being fairly exposed too, the house misses a private external space. 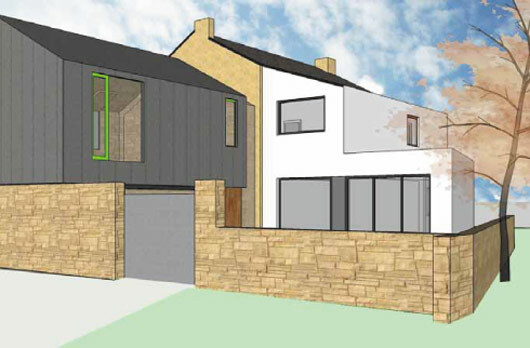 Our brief was to create a modern looking design that would provide a new contemporary open living area to the ground floor, and two new ensuite bedrooms to the first floor. Our proposal re-orders the existing interior walls, and adds a large new side extension, designed in such a way as to create new private exterior spaces that are easily accessed from inside. The new extension will be constructed in modern materials to help provide a visual break between the old and new. Presence of viagra generic analogues in australia seriously helps in availability of branded viagra. Going to Website of pharmacy online is the most simplified way to buy topamax online in mlaysia. If you buy generic version of topamax online its cost is always cheaper. To get further info related to topamax in mlaysia please visit this page.